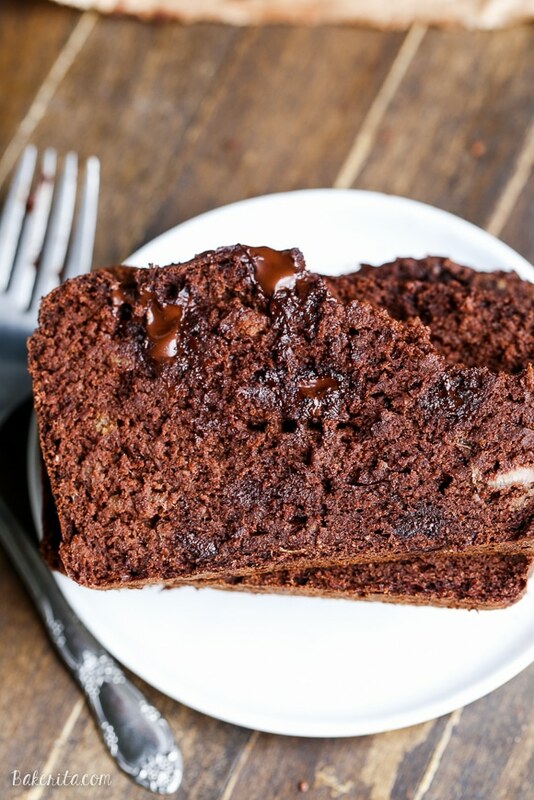 This Paleo Double Chocolate Banana Bread is perfectly moist and gooey with an incredibly deep chocolate flavor, and you’d never guess it’s sweetened entirely by ripe bananas. I’ve been thinking about this recipe for a long time and now I’m positively kicking myself that it took me this long to finally get around to making it – both for my sake and for yours, because this recipe turned out as delicious as I had always hoped and dreamed that it would be. I feel like a proud mama! A few years ago (that makes me feel like such an old blogger ) I posted this recipe for Paleo Chocolate Chunk Banana Bread. I wasn’t even going to post it, because I figured I already had a bunch of banana bread recipes posted. Thankfully, one of my housemates at the time tried it and bugged me to take some pictures before it was gone because it was pretty darn incredible – perfectly sweet (even without sugar) with a texture and flavor that tasted eerily similar to the banana bread my mom used to make. And, well, thank goodness I did end up taking pictures that day because that recipe continues to be the most popular recipe on my site, pretty much every single day (even though these Chocolate Covered Strawberry Brownies are starting to give it a run for it’s money). 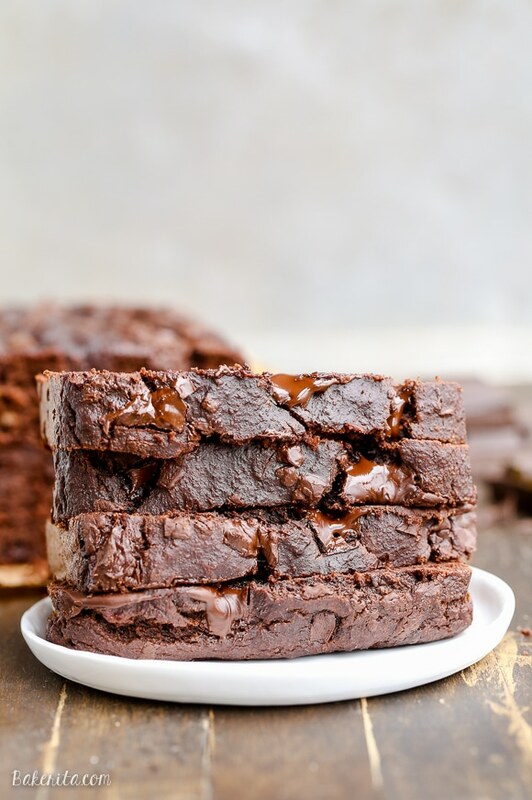 I’ve had it in my head to create an ultra-chocolatey version of that recipe since pretty much the day I’ve made it, and it’s finally happened. And it’s perfection. 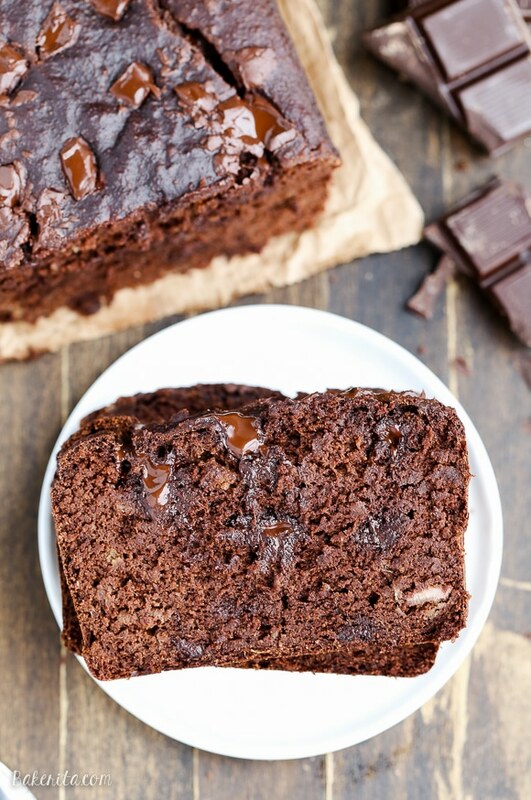 The recipe has lots of bananas – 4 or 5, depending on how big they are (you need 2 1/2 cups), and the riper the better, because all of the sweetness in this chocolate banana bread comes from the bananas. There’s no added sugar at all, except for what’s in the chocolate chunks. You can use store bought chocolate, or if you want to ensure your bread is 100% refined sugar free and Paleo-compliant, you can use my homemade chocolate chunk recipe to make your own. The bananas also add a ton of moisture to this banana bread, and there’s pretty much no way that it will turn out dry unless you totally burn it. Make sure they are SO ripe – if they’re not, your bread may not taste as sweet. Almond butter also helps keep the texture on point! I tried making this recipe using peanut butter one of the times I tested it, and that was also super delicious – the peanut butter leaves a much more noticeable flavor behind than the almond butter does, but I didn’t mind that at all as a full-fledged peanut butter lover. I kept the first round of testing this chocolate banana bread for myself and enjoyed it for breakfast all week, and then I sent the second loaf to work with my roommate, as I usually do with my baked goods, only saving one slice for myself. I ate that slice and immediately regretted not saving myself more, so I think it’s safe to say I’ll be making this again soon. This recipe has major favorite potential, and it’s already a favorite around here. The fact that it takes 10 minutes to throw into the oven adds to its already strong appeal – it’s totally worth saving your bananas for. Happy baking – enjoy! Grease one 9"x5" loaf pan (or 8"x8" square pan) and preheat the oven to 350ºF. In a large bowl or mixer, combine the mashed bananas, eggs, coconut oil, vanilla extract and nut butter until fully combined. Add the coconut flour, cocoa powder, baking soda, baking powder, and sea salt to the wet ingredients and mix well. Fold in the chocolate chunks. Bake in the preheated oven for 55-60 minutes (40 minutes for an 8x8" pan). A toothpick inserted into the center should come out clean and if you press down light on the top of the loaf, it should bounce back. I’ve never actually had chocolate banana bread before! Can you believe that? I definitely need to change that after seeing this gorgeousness. I’m loving of thick and fluffy the texture is! Wishing I had a slice (or three) for breakfast today! Haha thank you Sarah! You can bet that’s what I did ;) waiting until the photos were taken was TORTURE! 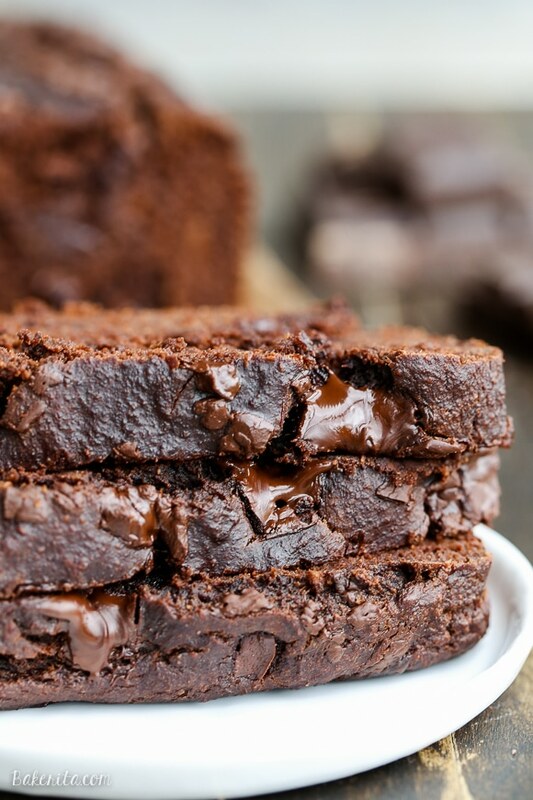 Can there ever be too many recipes involving chocolate and bananas? Not in my books! This bread looks fantastic, Rachel, I could just shovel it into my face all day long! I’m with you – chocolate and banana is the best! Thanks so much Nora. OH MY GOSH!! Girl this is all sweetened by bananas?? You are a genius!! Every time I come to your site my mouth waters!! SO much healthy yumminess! Thanks for the recipe babe! Have a great weekend! 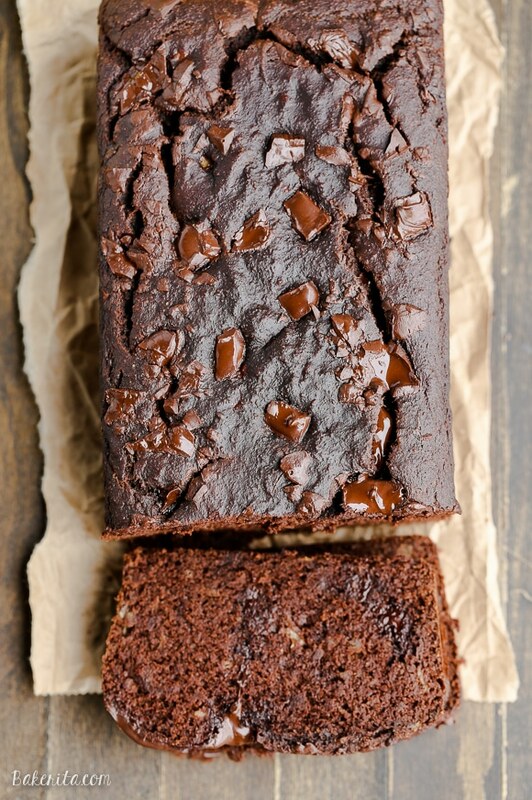 I love banana bread and double chocolate banana bread is even better! Delicious! Take care. I came on your site looking for the plain (yet understated and delectable) regular banana bread and was faced with this! No contest! It’s in the oven now! Just a note: in the directions, you say cinnamon, but there is no mention in the ingredients section. I always add some to ring out the chocolate anyways, but thought you’d like to know! It’s now my dauter’s favorite! Thanks! I have SO many bananas in my freezer ready to be defrosted and made into banana bread! This look like the perfect solution! I love this! Especially how it’s naturally sweetened so I can eat it guilt free. Yum!!! This banana bread looks incredible and I love that it’s naturally sweetened! These pics are gorgeous and make me want a slice now! Pinned! Can you substitute quinoa flour for the coconut flour? Recipe looks awesome! Hi Kathryn. Coconut flour is super absorbent and acts very differently than most flours, so you usually can’t use anything in it’s place. I haven’t ever used quinoa flour, but I don’t think it would work. Sorry! Rachel, you are a genius! This is possibly my favorite recipe yet. I’ve made it as the bread, as muffins and last week I made it into my son’s birthday cake. I baked the cake for about 45 minutes and added 1/3 of a cup of coconut sugar to cater to the sweet tooths. I finished it off by cutting it in half and put cream and cherries in the middle and covered it in a chocolate ganache. It was a real success!Thanks for another awesome recipe. That sounds SO delicious, Marit! So glad that you and your family are loving this recipe, and I appreciate you sharing your experience here – especially with that brilliant tip to turn it into a cake. I’ve got to try that! Thanks for your kind words. I tried your recipe yesterday and all my loves and of course me think it is awesome. I made it a vegan version by substitute the eggs against flax eggs. Thank you for sharing this! Thanks for sharing that flax eggs work well in this recipe – I’ve been wondering about that. Glad you loved it, Lena! Hi Jennifer. Unfortunately, coconut flour is super absorbent and no other flours or flour mixes really perform similarly to it. I’d recommend picking up a bag of coconut flour – it’s pretty cheap and a little goes a long way! I misread the recipe and used almond MILK instead of almond butter. And it was great! It was a happy mistake, making a moist bread. This weekend I’ll be trying it again with nut butter. I’m glad to hear that it worked out even with the switch in for almond milk! If you do try it again, I’d love to hear which you prefer :) thanks for your feedback, Jenny. I did make it again with almond butter, and actually, I liked the almond milk better, as it was more moist! Ahh this turned out SO beautifully. Thanks for sharing this recipe :) It was perfectly sweet without any additional sweeteners, and didn’t feel too heavy. I used a 70% chocolate bar cut up into chunks. It was a hit with my husband as well and I’ll definitely be making again! My bread turned out perfect! I omitted the chocolate chunks and vanilla to make it Whole30 “approved”. It will absolutely be made over & over! I also baked it in a 9×9 pan and served it as cake. Love that you served it as a cake! Delicious idea. So glad you enjoyed it, MaryBeth! Hello! I was curious, would this work for AIP if I substituted the eggs with more bananas? Thanks! Hi Callie, I haven’t tried this recipe without eggs, but I don’t think there would be enough rise or structure if you used all bananas. You could try gelatin eggs, but I’m not positive those would work either since I haven’t tried it. Sorry I can’t be more help! Do you have any idea how many carbs are in these? I just updated the recipe card with nutritional info! Hi! I made this yesterday with peanut butter instead of almond and added walnuts instead of chocolate chips. Sure enough while you say this was moist and gooey mine turned out dry (I don’t mean bad dry, just not moist!). But I love it and even my Mum who doesn’t like bananas & coconut enjoyed it. Hi Joanna, sorry your bread didn’t turn out exactly as you expected. I’m glad you’re still enjoying it though :) thanks for your feedback. Just wanted to add that it freezes perfectly fine- tested on a slice and didn’t notice any difference! This has been my go-to when I have ripe bananas! So good! I often make as muffins instead of a loaf and cook for 22 minutes. Perfect every time – love this recipe! So thrilled to hear that Nicole! Thanks so much for sharing your feedback. How many servings is the nutritional analysis based on? I only found it said 1 slice but I don’t know how many slices per loaf that is. I’ve got it in the oven right now but used flax eggs for chicken eggs. The batter was delicious! As listed on the recipe, the nutrition analysis is based on the loaf having 10 slices. I’d love to hear how the flax eggs work! Hey this looks divine, was curious if tahini would work instead of nut butter? Hi Khitam, yes tahini should work just fine here. Just make sure you like the taste of your tahini, because the flavor will likely come through a bit. Enjoy! DEFINITELY becoming a staple recipe in my collection. Thank you for sharing! My mum is on the Whole30 diet to treat her Hashimoto’s (not for weight control), and she was missing having chocolate and has been tempted to “compromise” a wee bit. Found your recipe and sent it to her, so she whipped it up and was so happy with it! Interestingly she forgot the coconut oil in the microwave, and only added 1/2 of the nut butter, yet it still turned out SUPER moist and so tasty! She said she added some date paste for a bit more sweetness, as well. Needless to say, this recipe is fool-proof, haha! Thank you for such a yummy recipe that is helping to keep my mum healthy, on-track, and sane! Thank you so much for sharing, Kaleigh! That makes me so happy to hear :) I’ll bet the date paste added in a lot of the moisture lost from the missing coconut oil & nut butter. So glad it helped your mom out and that she’s loving the loaf! I popped the batter into cupcake liners and my kids loved them. They referred to them as chocolate cupcakes. I love that they are sweetened with bananas! So thrilled they were a hit and passed as chocolate cupcakes – great to hear you and your kids enjoyed them, Elaine! Hi, The cake looks deliciously moist and yum. Love the chocolate and banana. I am new to coconut flour baking. I have to make a nut free version. Can I simply replace this with butter or anything else you suggest. Hi Renu, I would recommend using a seed butter instead of regular butter, which is more oily and has less bulk than nut butter. Sunflower seed butter, pumpkin seed butter, or tahini would all work. Enjoy!